As the perfect introduction to Sedona’s red rock trails, the Scenic Rim Tour is 90 minutes of winding, unpaved back roads. Hold on tight during this adventurous journey. Pink® Jeep® Tours will give you a ride to remember in one of the most incredible settings on Earth. Your Certified Interpretive Guide will greet you at the Pink Jeep Tour Plaza before inviting you to hop into a custom-built, open-air Pink® Jeep® Wrangler. Head up Schnebly Hill Road to marvel at its towering red-rock formations and picture-postcard views. Hairpin turns, steep cliffs and blind curves await as your Pink® Jeep® climbs 2,000 feet through canyons and washes. You’ll also see Munds Wagon Trail, a main “highway” between Sedona and Flagstaff that was completed in 1902; it was one of the state’s first and most popular cattle trails. The Mogollon Rim rises above you, while the city of Sedona sits below. Photo ops are plentiful on this tour, with many chances to use Arizona’s most stunning scenery as your backdrop. If you’re ready to take on Sedona’s rugged backcountry and see some of the Southwest’s most spectacular views, the introductory Scenic Rim Tour is right for you. If you’d like a more immersive experience, check out our extended two-hour tour or three-hour tour. It was a beautiful and fun way to enjoy Sedona! Beyond our expectations! We were so happy with all of it. We’re from NY and there was another group from NY with is. Sebastian made the trip what it was!!! He was AMAZING!!! So much fun!!!! Our guide was great! A fun family adventure! My daughter was sad it was over! We spent most of the time bumping around and really didn’t see that much. Far surpassed our expectations! Our kids 3 and 7, were smiling the entire time. The views were absolutely breathtaking, we got an experience we wouldn’t have gotten close to driving around Sedona on our own. We did the 1.5 hour rim tour and our kids are already asking when we can go back. Best part of our trip, we will be repeat customers in the future. Jen made the trip a lot of fun and gave us a great lesson along the way. Amazing. Randy was amazing. My twin fifth graders had recently covered a lot of the geology andt plate tectonics that Randy was clearly well versed in as he described the creation of the formations in the Sedona area. It was amazing to see them get to show what they knew and also learn so much from Randy. He was absolutely the best tour guide I have seen. A caring professional safe driver and a pure entertainer. Sean was friendly and entertaining and answered all of our questions. He was very knowledgeable and upbeat. We felt very comfortable and he was attentive to the children and their comfort. 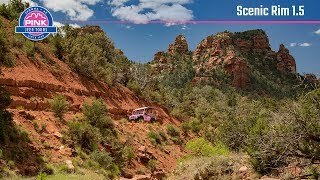 There are several pink Jeep your kiosks in Sedona. We went to the wrong one to start our tour. However, Kyle did come and pick us up.